Not to be confused with print screen. Screen printing first appeared in a recognizable form in China during the Song Dynasty (960–1279 AD). It was then adapted by other Asian countries like Japan, and was furthered by creating newer methods. A group of artists who later formed the National Serigraph Society, including WPA artists Max Arthur Cohn and Anthony Velonis, coined the word Serigraphy in the 1930s to differentiate the artistic application of screen printing from the industrial use of the process. "Serigraphy" is a compound word formed from Latin "sēricum" (silk) and Greek "graphein" (to write or draw). The Printers' National Environmental Assistance Center says "Screenprinting is arguably the most versatile of all printing processes. 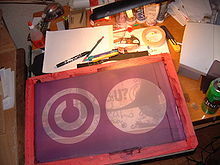 Since rudimentary screenprinting materials are so affordable and readily available, it has been used frequently in underground settings and subcultures, and the non-professional look of such DIY culture screenprints have become a significant cultural aesthetic seen on movie posters, record album covers, flyers, shirts, commercial fonts in advertising, in artwork and elsewhere. Credit is given to the artist Andy Warhol for popularising screen printing as an artistic technique. Warhol's silk screens include his 1962 Marilyn Diptych, which is a portrait of the actress Marilyn Monroe printed in bold colours. Warhol was supported in his production by master screen printer Michel Caza, a founding member of Fespa. Another variation, digital hybrid screen printing is a union between analog screen printing and traditional digital direct to garment printing, two of the most common textile embellishment technologies in use today. Essentially, digital hybrid screen printing is an automatic screen-printing press with a CMYK digital enhancement located on one of the screen print stations. Digital hybrid screen printing is capable of variable data options, creating endless customizations, with the added ability of screen print specific techniques. Before printing occurs, the frame and screen must undergo the pre-press process, in which an emulsion is 'scooped' across the mesh. Once this emulsion has dried, it is selectively exposed to ultra-violet light, through a film printed with the required design. This hardens the emulsion in the exposed areas but leaves the unexposed parts soft. They are then washed away using a water spray, leaving behind a clean area in the mesh with the identical shape as the desired image, which will allow passage of ink. It is a positive process. In fabric printing, the surface supporting the fabric to be printed (commonly referred to as a pallet) is coated with a wide 'pallet tape'. This serves to protect the 'pallet' from any unwanted ink leaking through the screen and potentially staining the 'pallet' or transferring unwanted ink onto the next substrate. Next, the screen and frame are lined with a tape to prevent ink from reaching the edge of the screen and the frame. The type of tape used in for this purpose often depends upon the ink that is to be printed onto the substrate. More aggressive tapes are generally used for UV and water-based inks due to the inks' lower viscosities and greater tendency to creep underneath tape. The last process in the 'pre-press' is blocking out any unwanted 'pin-holes' in the emulsion. If these holes are left in the emulsion, the ink will continue through and leave unwanted marks. To block out these holes, materials such as tapes, speciality emulsions and 'block-out pens' may be used effectively. The original image is created on a transparent overlay, and the image may be drawn or painted directly on the overlay, photocopied, or printed with a computer printer, but making so that the areas to be inked are not transparent. Any material that blocks ultra violet light can be used as the film, even card stock. A black-and-white positive may also be used (projected onto the screen). However, unlike traditional plate-making, these screens are normally exposed by using film positives. A screen must then be selected. There are several different mesh counts that can be used depending on the detail of the design being printed. Once a screen is selected, the screen must be coated with emulsion and dried. Once dry, it is then possible to burn/expose the print. The overlay is placed over the screen, and then exposed with a light source containing ultraviolet light in the 350-420 nanometer spectrum. Cracking ink effect is when the ink produces an intentional cracked surface after drying. The primary cause of unintentional cracking of ink is from the ink not curing fully. Discharge inks use Zinc Formaldehyde Sulfoxylate to activate the dye in fabric to discharge from the originating fabric. Discharge inks are available in clear or colors. Cons of using discharge inks is that the process only works properly on dark fabrics that have a content of 100% cotton. Fabrics with under-dyes and fabric blends will discharge their dye to different degrees. The fumes resulting from the application and curing are pungent and strong ventilation and a face mask are commonly needed to relieve exposure. Pros to this process is that discharge is especially effective for distressed prints and under-basing on dark garments that are to be printed with additional layers of plastisol. It adds variety to the design and gives it that natural soft feel. Foil is much like flock, starting with an adhesive glue or plastisol ink base layer. Foil is finished by applying a thin sheet of reflective/mirror like material on top of the screened base, then heat pressed to set. The foil substrate does not adhere to non-screened areas of the design, and the balance of the foil sheet is discarded. High Density is a process which uses a type of varnish against a lower mesh count with many coats of emulsion or a thicker grade of emulsion (e.g., Capillex®). After the varnish passes through to the substrate, an embossed-appearing, 'raised' area of varnish is created. When cured at the end of the process, the varnish yields a Braille effect, hence the term 'High Density'. To print multiple copies of the screen design on garments in an efficient manner, amateur and professional printers usually use a screen printing press. Many companies offer simple to sophisticated printing presses. These presses come in one of three types, Manual (also referred to as Handbench), Semi-Automatic, and Fully Automatic. Most printing companies will use one or more semi-automatic or fully automatic machines. ^ Sheng, Angela (1999). "Review: Why Ancient Silk Is Still Gold: Issues in Chinese Textile History". Ars Orientalis. 29. JSTOR 4629553. ^ "History's Influence on Screen Printing's Future | ScreenWeb". screenweb.com. 2006-05-04. Archived from the original on 2013-01-21. Retrieved 2012-11-15. ^ "Serigraphy | Define Serigraphy at Dictionary.com". Dictionary.reference.com. Archived from the original on 2012-10-25. Retrieved 2012-11-15. ^ a b "patft » Page 1 of 1". Patft.uspto.gov. 2010-08-26. Archived from the original on 2012-10-19. Retrieved 2012-11-15. ^ "Industry Analysis". Sgia.org. Archived from the original on 2012-10-14. Retrieved 2012-11-15. ^ "Flatbed cylinder screen printing". Screenprinting Technology. Archived from the original on 14 April 2018. Retrieved 8 May 2018.